This is a project that it's heavily based on the older Home Monitor project. 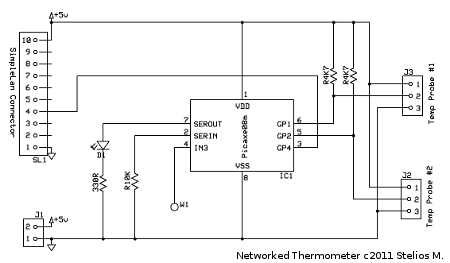 What it does is that gets the temperature from 2 digital 1-wire thermometers (DS18B20) attached on the board and displays the values on a web page through the embedded web server. 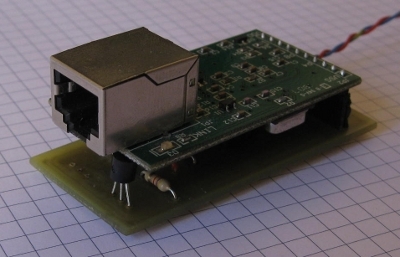 This project uses the Picaxe 08m uC, a SimpleLan module and a couple DS28B20 1-wire thermometers. Also, in order to have the temp values displayed on my web site (link) I've setup a small cron job on an embedded linux device to run a Lua script which collects the temperature values from the embedded web server and sends the values to my web site. This is how the device looks. The schematics and PCB are designed using the free ExpressPCB software and the development of the PCB was done using the photo-resist method, as described here. The circuit schematic is very basis and it's heavily based on the circuit provided in the Picaxe manual at the 'Interfacing' section. 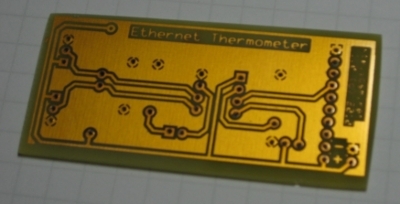 The PCB after etching and drilling. Finding an AVCOM SimpleLan module might be difficult these days. I'm not sure if they still sell them. You will need to upload a very basic web site to the SimpleLan which displays the register values in order for the Lua script to be able to read them. You can see the results here! Please note that sometimes the embedded device it's either turned off or used for other projects. Comments and suggestions are welcomed. PS: More files will be available soon.